It’s the third Ashes Test of the 1936-37 Series and the race for the greatest batsman in the world title is well and truly on between Donald Bradman and a certain Wally Hammond. The first Test of the series at Brisbane had been a disaster for the normally prolific Bradman, scoring 38 and 0. Australia had lost by 322 runs. All out for 58 in the second innings was the icing on the cake for the English. A humiliating defeat. The second Test at Sydney wasn’t going much better when Wally Hammond scored 231 not out and England declared at 426 for 6 after a thunderstorm the third morning. Bradman walked in and went for a first ball duck. Australia were all out for 80 on a “juiced up” pitch as a contemporary account had it. Australia followed on and with Bradman on 24, Walter Robins dropped a hook from him that was going straight into his hands. It was going to be a costly miss. Bradman goes on to score 82 and then is bowled by Hedley Verity. Despite a gritty innings of 93 from Stan McCabe, England won the math by an innings and 22 runs. Allen’s comment turns out to be less prescient than Waugh’s would be years later. At that stage, Bradman’s average from 4 innings was 30. And the same question that Kersi Meher-Homji raised on The Roar this week about Steve Smith was being raised about Bradman – was his captaincy affecting his batting? As was the norm in those days, the pitch was uncovered. And it rained. Australia bat first on a pitch that the Wisden Almanac called a “glue-pot” wicket. 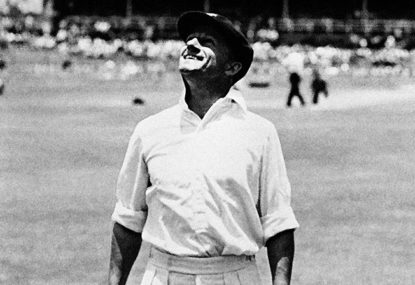 At 200 for 9, Bradman declares so that the Australian bowlers can get at England. Sure enough, on an unplayable wicket, despite a brilliant 32 from Wally Hammond, England struggle to 76 for 9. Allen then declares, to in turn, get at the Aussie batsmen. By then the sun is out, and Bradman plays an absolute masterstroke. Something no other captain has done until that point. He sends in the Nos. 9, 10, and 11 to bat first up to give the top order a better chance on a pitch that has hopefully dried up. His lower order batsmen do their best, and with Australia at 97 for 5, Bradman comes in to bat at No. 7. He adds 346 for the sixth wicket with Jack Fingleton, the opener who has come in at No. 6. Bradman’s aim is not only to score enough to win the game, but make a statement to the English team to tell them he is back. Bradman scores 270 and leaves England an unattainable 689 runs to win the Test. England are bowled out for 323. Bradman then scores a 212 in the fourth Test at Adelaide and a 169 in the final Test at Melbourne, amassing a mammoth 810 in the five matches to turn the series and give the Aussies a 3-2 Ashes victory. It was however the third Test 80 years ago in Melbourne that turned the series on its head. And Bradman’s unconventional approach to captaincy that made this one of the most interesting Test matches in the history of cricket.